Influencer marketing is all the rage right now. But most people don’t know what an influencer even is, let alone how to go about hiring one and determining what they would actually do. 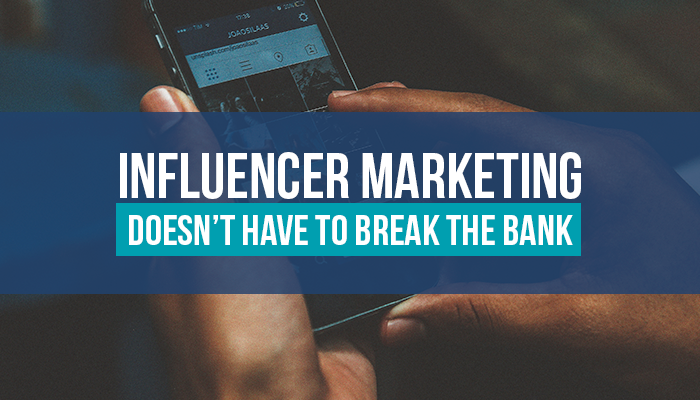 But influencer marketing can be a good thing – and as the title of this article suggests, it doesn’t have to break the bank. But really, influencers are just people with large social media followings and a voice that people want to hear. Their followers tune in every day/week/month to see what these cyber-celebrities are doing or saying, and what they are wearing or drinking. The followers want to emulate them or just peek into their world. Dealerships are starting to catch on and trying to determine what influencers can do for them. Will they help sell cars? If so, how? If the dealership can “get” them, what will it cost? Will they produce trackable ROI? Are all Social Media Influencers the Same? In the realm of influencer marketing, there are different levels of influencers. Some athletes have huge followings and can provide a ton of exposure, but the price for them will be huge. You’ll have to consider what you’ll get for your money and need a formal agreement drawn up. A contract can save your rear end. Don’t be intimidated by their celebrity. Protect the dealership at all costs. There are mid-level influencers, perhaps in your industry, who can attract a nice following. These can be more affordable, and one of them might even become a long-term spokesperson for your dealership. But my current favorites are the micro-influencers. These are local people who are very active on social media. They might be business owners or coaches, local artists or group leaders in a cool niche hobby. Whoever they are, start watching them. If they have a following similar to your company culture, start considering them. Study them and their tribe. Why would they want to work with me? Micro-influencers have their own agenda, and if you can determine what it is and what they want, you can decide if you can help them while they help you. An influencer arrangement could look like the one I recently orchestrated for a dealership with a solid social media presence, active pages and a highly engaged community. We decided we wanted to play in the micro-influencer world. Now, as an agency, we are very involved with every community where we have a dealership, and we do our best to listen to what’s happening in each city and see who people are following. In this particular city, a very active entrepreneur was launching a new business – a healthy meal prep and delivery service – and needed exposure. I decided to reach out and ask him if he would mind sharing some of his social media space with us; in exchange, we could help him deliver meals in a 2018 Kia Sorento. He agreed immediately, and we set a date to meet. I brought my camera crew with me, and we drove the Sorento to deliver meals while I interviewed Jon and we intermittently discussed the KIA. We went live on Facebook and took pictures and video for future use. Is your company’s social media solid? You don’t want to ask an influencer to pop on a sloppy channel that offers him or her little or no value. Do you have several people in mind? You may need to ask a few before you get one to say yes. What will the activity be? What product/service will you promote? What product/service will you allow them to promote? What social media platforms will you use? How long will you be allowed to use the content? There’s more to consider, but this is a good start. Sometimes you will miss the mark – and that’s okay. Don’t abandon influencer marketing just because of one failure. What would we tell our sales staff if they missed a sale? To quit? No! Perfect the process and try again. Once, I paid a social media influencer to bring some hype to a Southern California Honda dealership for their Type-R rollout. I’d met this influencer at Social Media Marketing World, and he was making a name for himself as a Snapchat storyteller and keynote speaker. I asked him if he felt this Honda rollout would be a good fit and whether he could attract a crowd. He was confident he could, and we signed an agreement. My team flew to Southern California a day early to prepare for the event and get the hype rolling. Our influencer arrived on time, and we began a three-hour bash with balloons, food, banners, Facebook Live and Snapchat. We were doing it all. No one came. I mean, no one. The smile never left my face. We just kept shooting and going live, snapping and eating the food. I decided we needed to at least get some good content from this, and we decided to take a few cars on test drives and have the influencer drive while we recorded it all. I rarely admit defeat, and this day was no different. But I did learn from this event. I learned to start smaller and stay more local when dipping my toe in the influencer market. How did the results from the local micro-influencer (the guy with the meal-prep service) stack up to what we got from the social media biggie? There’s simply no comparison. The local dude totally rocked it. Who in your community is killing it on social? How can you collaborate with them? What do you have to offer them? Get great at the ask. Robin Wilson is the co-owner of SCP Agency. She is a self-proclaimed social media guru and specializes in social marketing for auto dealerships. She has also been instrumental in teaching auto dealerships how to market through social media to their existing database and shows them how to make sure that they do not become victims of conquest marketing. She is a marketing coach to all and has become a leader in Facebook marketing strategies in the U.S.